Wild animals can cause persistent problems for electrical substations, gas plants, airports, and commercial facilities. Allstate Animal Control offers a cost-effective animal deterrent system for precisely this problem. Our barriers prevent both above and belowground access to an area by rats, raccoons, squirrels, snakes and other wild animals. Wildlife at a substation will chew through wires, nest in breaker boxes, blow transformers, and generally interfere with electrical equipment and components. These animal activities cause power outages which are expensive to repair and can can seriously affect distribution station performance and electrical transmissions. Such outages are also inconvenient for customers and can damage their computers and appliances. No power outage or electrical shutdown is necessary during installation of our rodent and snake barrier. Let Allstate Animal Control provide the security, reliability, and protection you need. 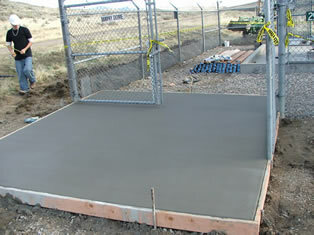 To prevent animal intrusion into this substation, a concrete drive pad was necessary. 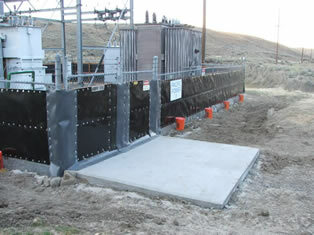 Power outages can be prevented through the installation of appropriate barriers, both above and below ground. Here we are preparing to install a concrete driveway. In this photo, the concrete forms are being set up to prepare for the actual concrete drive pad to be installed. Here is the finished concrete drive at the entrance gate. Rats and raccoons had gone through or over the chain link fence, entering the substation and shorting out transformers. This activity caused great revenue losses to the electrical utility company and to their customer-- approximately $30,000 a day for each blown transformer. 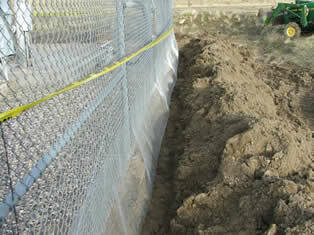 We installed an underground rodent fence to block out skunks, rats, raccoons, and snakes. 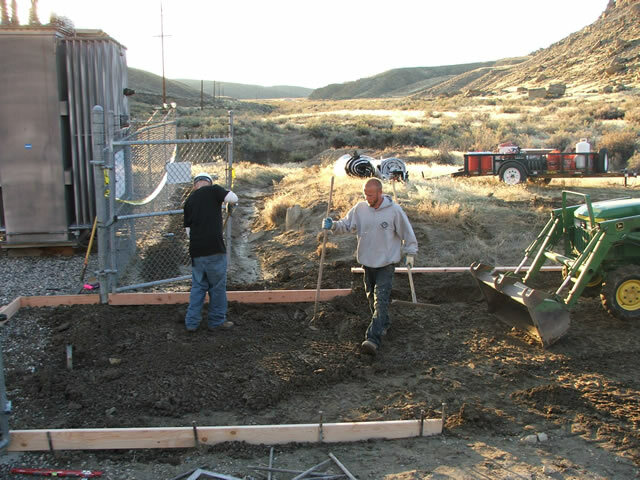 The fence is installed deep below ground to prevent burrowing animals from gaining access. 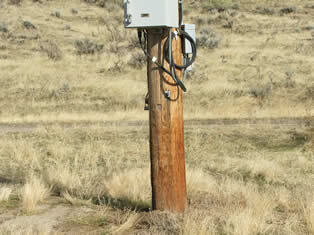 Complete animal removal will allow the substation to function with far fewer service interruptions. 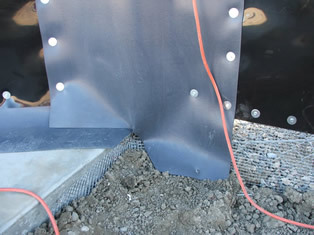 This rodent slick fence requires heavy exterior treated two-by-four or two-by-six frames. With the frames in place, the slick fence can be attached to the existing fence. 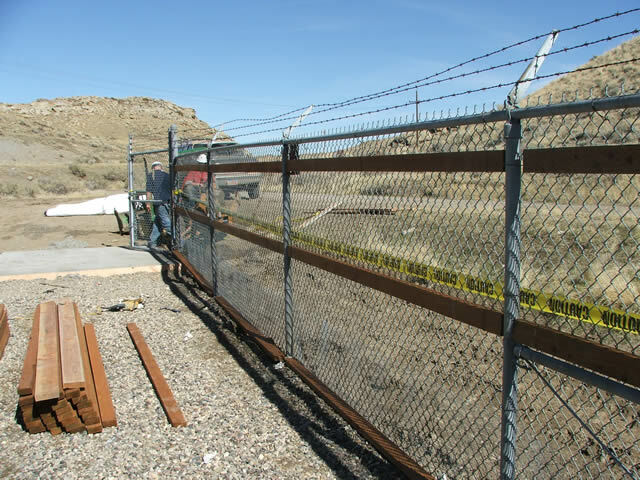 Slick fence can also be attached to concrete walls, foundations, substrates, etc. Rats, raccoons, and squirrels were climbing the telephone poles and accessing the substation by scaling the high wire system to the transformers. Rodent removal became critical to operations. 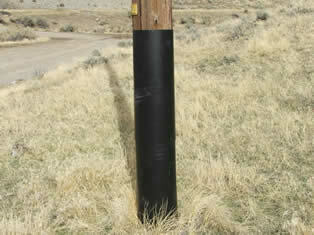 We installed a rodent slick sheet blockade on the telephone poles so that animals cannot climb to the electrical boxes or access the high wires. We have had excellent success in preventing all burrowing and climbing rodents from gaining access. Comprehensive rat control can be achieved, even in semi-enclosed structures such as this. You can see that we attached the slick sheets to the chain link fence, preventing any animals or rodents from climbing or gaining access to the station. Note the different color of material at the gate hinge points. 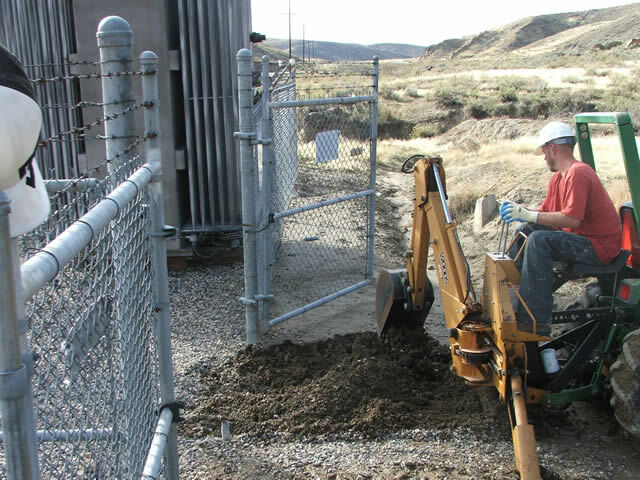 This product is a flexible slick fence used for gate openings and hinge points. 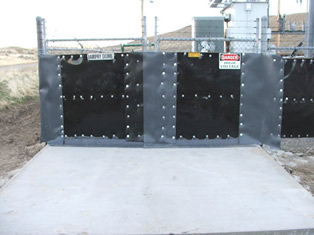 The material has been culved or curved at the bottom, allowing the gate to open and close tightly. This is a detail of where the gate, concrete, and slick fence meet. Animal control measures must include sealing up or blocking even the smallest gaps. 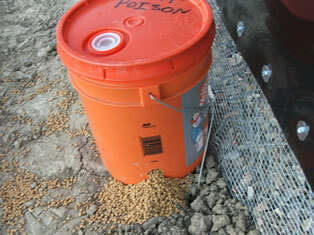 This is a five gallon container of rodent poison. It is refillable with a multi-feed rat poison, controlling the incoming animals for up to ninety days. This step will greatly contribute to rat control in the area. We realize that our completed system looks unique compared to most chain link fence barriers. This substation is in a remote area and visual aesthetics were not necessary. The goal --to prevent wildlife outages-- was achieved.